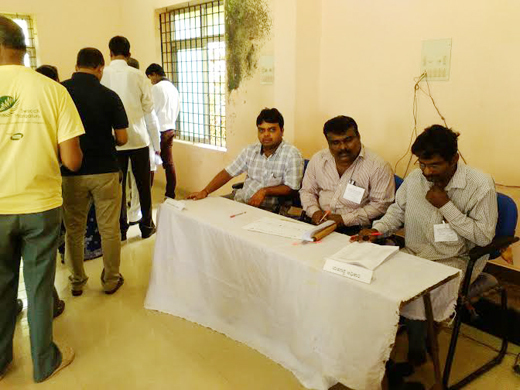 Mangaluru, Nov 06, 2015: The Dakshina Kannada district unit of the Red Cross Society held the second general election in it’s history on Nov 1 and democratically elected a fresh team of ten office-bearers/executive. More than 800 members participated in the polls led by DK DC Adoor B Ibrahim. 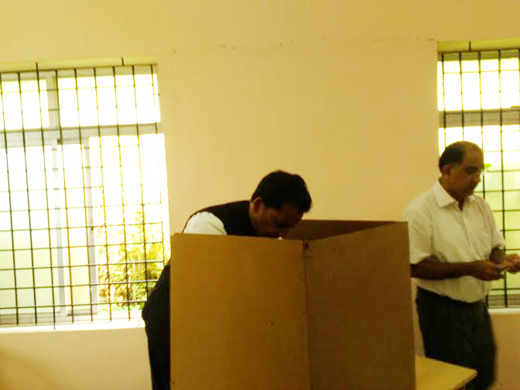 The elected are stated to be : Shantharama Shetty, Ravindranath, Sushil Jattanna, B. Nityananda Shetty, Dayananda Shetty, Prabhakara Shriyan, Vasanth Shenoy, Dinesh B. Rao, Venu Sharma and Sacheth Suvarna, all who bagged a majority of votes it is said. Shantharam Shetty in a release stated the society is charged with the vital responsibility of extending its reach and service beyond blood bank activities. An international service orgasnisation; the DC of the district is the President at the district level, while the State Governor is the President at the State level. The President is the head at the National level. The DK IRCS was started in 1997, but for the first time an elected body came into being only in Nov 2012, to be active for 3 years. Soon the elections here are due. During the previous term, DC Adoor B Ibrahim IAS has been the President. Sri. B Prabhakar Shriyan was Chairman and Sri.Ronald Fernandes Vice Chairman. Sri K V Nagaraj Hon.Secretary and Sri Shashiraj Rao Kavoor Hon Treasurer. It was a proud moment for DK IRCS unit when it was awarded the ‘Runner-up’ award for the year 2013-14 int eh best unit category. On May 8, 2015 HE Governor of Karnataka Vajibhai R Vala on the occasion of World Red Cross Day presented the trophy at Bengaluru, to the DK delegation led by the DC Ibrahim. It is to be put on record, as on 31.03 2015 the total number of members was 1283, as against 1174 the previous year. During the year 2014-15 87 Blood donation camps were held, 2761 blood units were collected and 2730 blood units were issued out. In the recent past ‘blood component separation unit’ was inaugurated at the re-arranged blood bank at located at Govt. Lady Goshen hospital in the city. This blood component separation unit is worth over a crore of rupees and was donated by BPCL as part of it;s CSR actions. KMC hospital also provide vital back-up services free of cost for DK IRCS.